She is known as the Dutch singer with a voice similar to Whitney Houston’s range, she has participated in a past edition of the Eurovision Song Contest and at present time she has won the American audience’ s heart through her performances on the tv talent show “America’s Got Talent” . It’s no other than Glennis Grace! Despite not making her dream come true then, by achieving a significant placing, as she didn’t qualify to the Grand final, this periodo she is storming with her vocal skills America’s audience, which secured her a place in the finals of America’s Got Talent. Just some days before the final during an interview to the RTL Boulevard channel she revealed that in short time she will make a big announcement . Could this be an implication for a potential Eurovision comeback, since the Dutch broadcaster has got us used to early announcements concerning its Eurovision representative. If this happens it will be the second time in a row the country will be represented by an artist that returns for a 2nd participation, after this year’s Waylon’s participation , whose first time was as member of The Common Linnets in 2014. 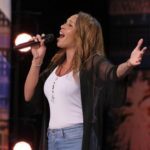 Would you like to see Glennis Grace back on the Eurovision Stage? Does a possible return have potential for a good result? Share your thoughts with us and stay tuned on the INFE Network and its regional sites for more updates around your favorite song contest.